Just as a reminder, there will be no weekly recap this week because my receipts got “lost” and I decided to make this week about fun and experimentation instead. Experimentation is an important part of learning, so I let go of my financial constraints and played around with some food that I’ve wanted to try for a while. Farro is one of those foods. I’ve actually built a whole week’s worth of posts about farro, but we’ll start with the basics: How to Cook Farro. A lot of you are probably asking yourself that question. It’s often referred to as an “ancient grain” and is thought to be the ancestor of many modern day grains, including wheat. Today it’s most commonly grown in Tuscany, so you’ll find this grain used a lot in Italian cooking. It’s usually sold whole (with husk and bran), semi-pearled (no husk and polished to remove some bran), or pearled (all bran removed). Farro has a nutty flavor (more so when bran is intact) and a delightfully chewy texture–my favorite part! The shape holds up well to cooking, which means it’s great for tossing into soups. The fun, chewy little grain also make a great addition to salads where they can add quite a bit of texture and inexpensive bulk. No other reason than it’s been really popular lately and I was curious about it. I love cooking with whole grains because they’re inexpensive, filling, have a lot of nutrients, AND they’re quite versatile. So, I wanted to expand out past my usual rice/bulgur/barley circle and try a new grain. In the coming week I’ll show you five ways you can use cooked farro (or any grain) to demonstrate how convenient it can be to cook one large pot of grains at the beginning of the week and then use that to build different meals throughout the week. Since farro is pretty trendy, it can fetch a high price when pre-packaged. I bought my farro from the bulk bins at Whole Foods for $1.69/lb. (organic). Comparatively, the pre-packaged Bob’s Redmill farro was about $5/24oz. bag ($3.33/lb.) at the other grocery store. You should be able to find farro at most health food stores, some larger grocery stores (especially if they have a natural foods section), or Italian markets. As I mentioned earlier, you can get whole farro, semi-pearled farro, or pearled farro. Whole farro, which has all of the bran intact has the most nutrients, but it also takes the longest to cook. The more bran that is removed by the polishing (or pearling) process, the more nutrients are lost and the quicker cooking it becomes. I prefer semi-pearled because it cooks relatively quickly, still contains a good amount of nutrients, and has a chewy-yet-soft texture. Because the hull on whole farro requires some extra steps for cooking and semi-pearled farro is much more common in the United States, I’ll be giving cooking instructions for semi-pearled farro. Because farro holds up to cooking quite well, you can actually cook it like pasta. 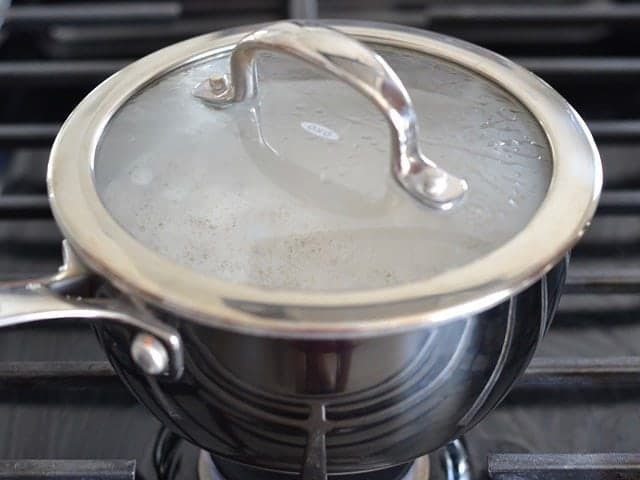 What I mean by that is that you don’t have to worry about any tricky water to grain ratios or getting the simmer temperature “just right” because the grain will hold up to excess water, which is then drained away after cooking. The degree to which the farro breaks down is much more dependent on the length of cooking than the amount of water or liquid used. You can cook it down to a creamy porridge or risotto consistency, but it just requires a little extra time (and closer attention to the water/grain ratio). This is what the uncooked farro looks like. You can tell this is “semi-pearled” farro because you can see some of the brown bran, and in some areas it is polished through to the white starchy center. Semi-pearled farro usually needs to simmer for 20-30 minutes to become tender, but the time will ultimately depend on how much bran is removed. This step is optional, but it does boost the nutty flavor of your farro. 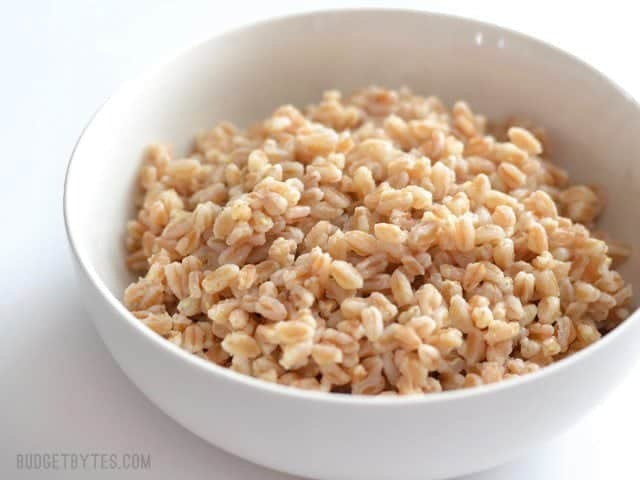 Place the dry farro in a pot and cook over medium heat, while stirring, for 2-3 minutes. You should smell a nice toasty aroma, similar to the smell of bread in toaster. When you smell that, you’re good. 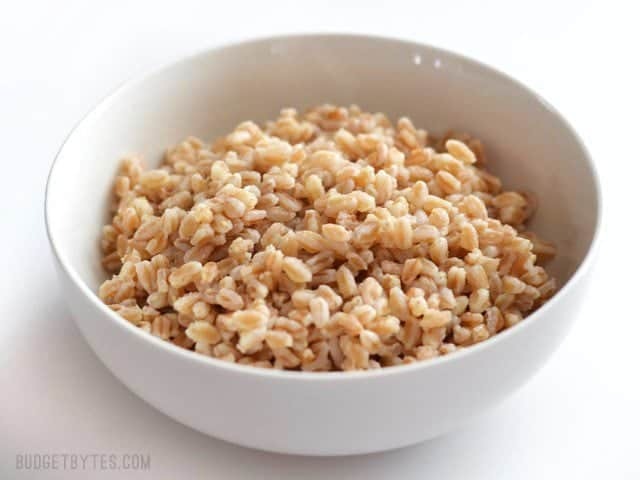 After toasting, add enough water to cover the farro by a few inches, plus a pinch of salt. For reference, I cooked 1 cup farro and added 3 cups of water plus about 1/8 tsp salt. The pot should already be hot from toasting the farro, so it will come to a boil quickly. Once boiling, place a lid on the pot, turn the heat down to low, and let it simmer for 20-30 minutes, or until the farro is tender. 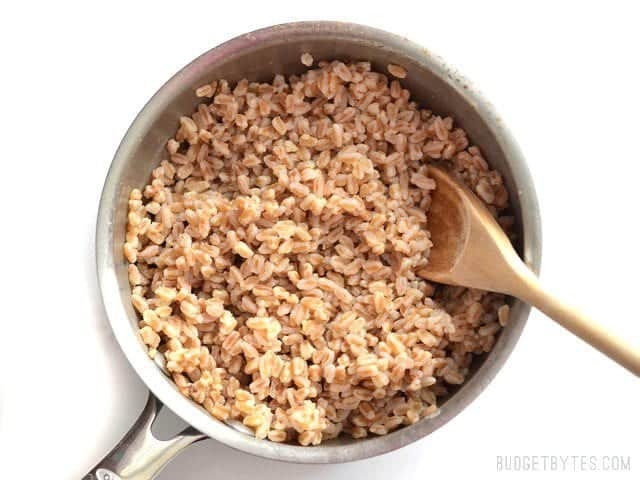 Test the farro starting at about 15-20 minutes to avoid over cooking and to see where you personally like the texture. The farro will absorb a lot of the water, but the excess should be drained off. You can either use a colander or just carefully tilt the pot while using the lid to hold the grains in place. Drain off as much water as possible to prevent it from turning mushy. I like to let the farro cool just slightly before fluffing it up with a spoon. The farro is now ready to eat, refrigerate, or freeze. If freezing the farro, I suggest cooling it completely in the refrigerator before transferring it to a freezer bag, squeezing out as much air as possible, then freezing. Farro can be used just like any other grain, or even used in place of pasta for many recipes. Over the coming week I’ll make five different recipes using this cooked farro. Can’t find farro? No worries. Most of the recipes I’ll be making can use a different grain or pasta in place of farro if you can’t find it in your area, or are just not into it. What About Your Instant Pot? Already a farro fan? Share your favorite ways to eat farro in the comments below! 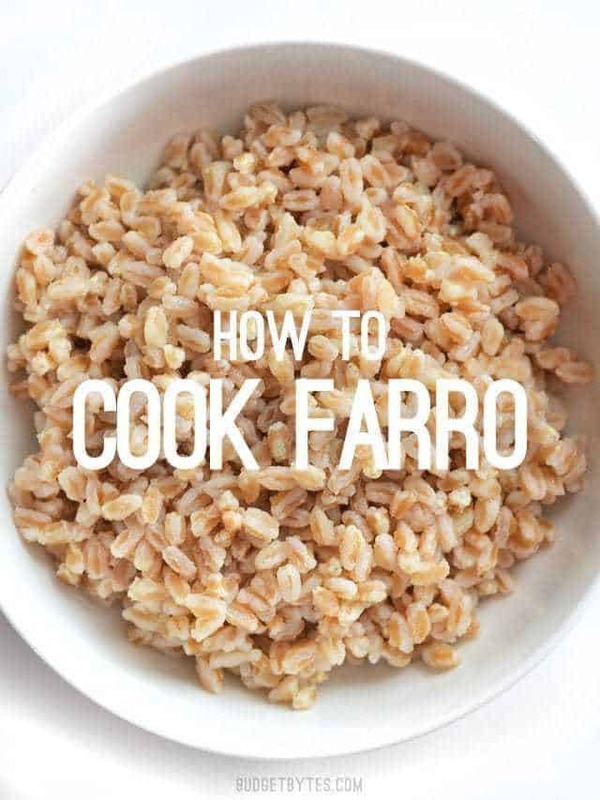 I needed to know how to cook some bulk farro, so I came to you. Thanks so much – I love your recipes and guidance! I recently ordered a “porridge ” for breakfast at a restaurant that turned out to be cooked farro served with a lightly sweetened coconut milk, dried fruits, marcona almonds and honey. It was absolutely delicious!! How interesting! I did not know this food! Mediterranean farro salad with vinaigrette, hunks of parmesan, and roasted veggies. I <3 Farro! Look, I love cooking, and making specialties. I have an Instant Pot. I have whole farro. I want to cook it in my IP, but I’m nervous about getting the water & time right. Would you say to just treat it like brown rice? Any other suggestions? A thing I like to do is get a rotisserie chicken, disassemble it, put the skin, bones, etc. in a pot to simmer for a while while shredding or chopping up the chicken meat; then strain the broth, add a cup of farro to it, cook, and add the meat back in at the end. What’s the ratio of dry-to-cooked for farro? You actually don’t have to worry about that. Cook it in an excess of water and pour off the extra once it’s tender. :) Just add enough water to the pot to cover the farro by double the volume. 1 cup of dry farro will be 2 cups of cooked farro. Hi! I’ve been to two Whole Foods in NYC (Manhattan) and haven’t seen Farro in the bins. Is it called or sold by another name? Thanks for the help. 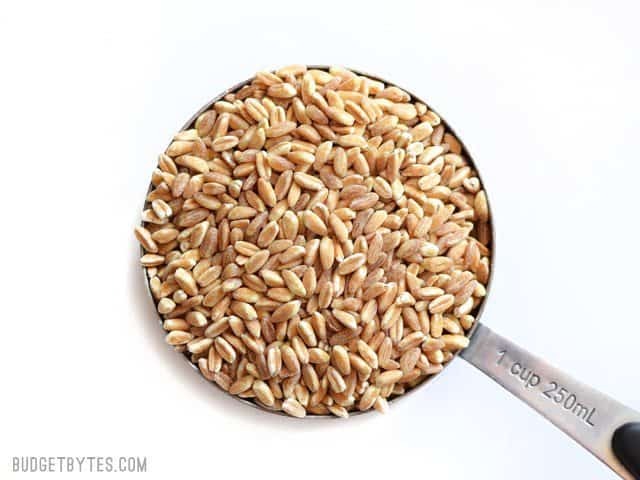 I’ve seen it labeled Winter Wheatberries or Red Wheatberries At Whole Foods. For salads, like your Mediterranean salad, have you/anyone tried using stock to make the farro? 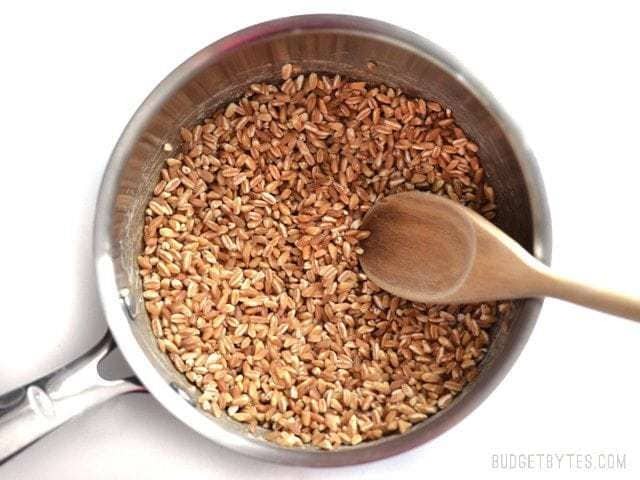 Joy: Farro and wheatberries are essentially the same thing (http://motherwouldknow.com/what-is-the-difference-between-farro-freekeh-and-wheatberries/) and wheatberries are always WAY cheaper than farro. I’ve had both and honestly can’t tell the difference.